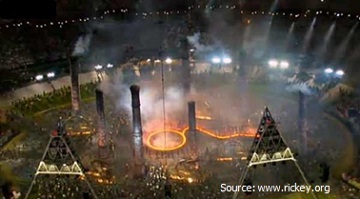 In recognition of Great Britain's ranked most energy efficient of world's largest economies by American Council for an Energy-Efficient Economy (ACEEE), EnMS-Doc submitted an article to "Kankyo Business"(Japan Business Publishing Co., Ltd.) about what we saw at the Opening Ceremonies of the London 2012 Summer Olympic Games. No one will deny one of the factors, which caused the industrial revolution to take place from 1760s to 1830s in Britain, was the strong development of globalisation through the trade policy. However Dr. Robert C. Allen, Professor of Economic History at Oxford University, in his column (http://www.voxeu.org/article/why-was-industrial-revolution-british/) introducing his book "The British Industrial Revolution in Global Perspective" pointed out the factor of the low energy cost situation due to the exploitation of coal. In spite of Britain's globalisation approach, the industiral revolution in the other countries were not as effective due to economical situations. In other words they face the barrier of having a higher energy cost. 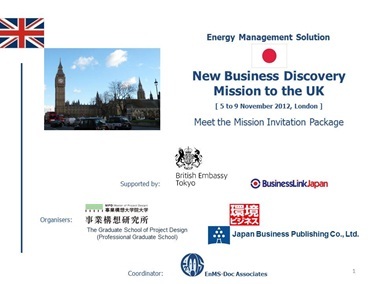 EnMS-Doc is coordinating the mission, organised by Japan Business Publishing Co., Ltd. and The Graduate School of Project Design, is seeking companies willing to do business in Japan with partnership arrangement in the field of sustainability, and willing to take advantage of this mission coming to London area. Japan is struggling to identify what will be the next step in the field of sustainability. One reason is that there is no direct Japanese translation of the word "sustainability". The other is in terms of the business related to energy management, Japan needs to make more effort to harmonise with the rest of the world. As a first step to counter these issues, "Japanese Sustainability Business Discovery Mission to the U.K." was organised supported by UKTI Japan/British Embassy Tokyo seeking potential partners willing to do business in Japan with their new ideas, technology, products, services, etc. in the field of sustainability. It will be approximately 20-company mission, leaders in sustainability business in Japan with diverse range of business types such as energy solution provider, IT implementer, building facility management, IT and control company, BEMS-aggregator player , ESCO player, etc., aiming to get acquaintance with companies interested to explore business in Japan. Our immediate aim is together with UKTI to identify business units interested to explore Japanese market by forming partnership with Japanese companies pursuing sustainability business development. Any individual or company considering this mission as an opportunity, how about a rendezvous. There will be several options to meet the mission however the major event will be the "Sustainability Day" at The University of London on Monday 5th November, an open forum aiming for the mission members to meet and exchange ideas with partner potentials. Kindly please contact us if you are interested or your recommendations to identify companies who may wish to meet the mission. "Meet the Mission Invitation Package" for download. The "BEMS-Aggregator", a 30 billion yen (GBP 240 million) project, is to ensure better energy performing 20,000 small/medium buildings (less than 500kW contract) and 10,000 model homes by promoting installation of BEMS (HEMS for homes) and to appoint aggregators to measure the improvement on behalf of METI. There are 23 designated "BEMS-Aggregator" companies, and with their consortium partners, there are 77 player companies (Download list of aggregators and consortium companies). The project has officially started on 17 April this year. For the intended delegation, the members will be most likely from those 77 companies. Please contact Nobby yamanouchi (nobby@enms-doc.com) if you have any further question. 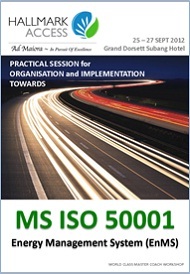 We are organizing together with our EnMS partner in Malaysia, EeSolution Engineering view company profile page , a 3-day workshop to make the participating organisation to become competent to self-declare ISO 50001. To gain knowledge of how to measure and quantitatively verify the saving results using proven regression analysis tool. Participants gaining competency level to lead their organisation to implement EnMS operation good enough to self-declare ISO 50001, International Energy Management Standard. organisation when they return from the 3-day sessions.